Sometimes you get caught in the rain during a trail ride, or at an event. It's also nice to go out and ride in a pleasant rain. However, if the weather turns violent, your horse may become quite upset and spooky. It’s important to know what to do when the weather turns ugly. Here are tips for making the best of things in rainy weather and avoiding hazards in bad weather. If you choose to ride in the rain, check weather forecasts to be sure that it is only going to rain. In a hard rain, your horse might try to turn around, so its rump is to the wind and rain, with its head down. This is how horses stand in bad weather to protect themselves. Riding in a thunder or hail storm isn’t a good idea. People and horses do get hit by lightning, so if the thunder rumbles, head indoors and wait for clearer skies. If you are close to home, quickly head for shelter if you can. If you get caught away from home in a thunderstorm, even if the thunder seems distant, avoid high areas, such as hilltops and low-lying areas that may flood in a downpour. In some places, flash floods can become quite dangerous. Stay away from lone, or small clusters of tall trees, wire fences or other metal structures. Dismount and tie your horse safely to a low bush—not a tree. Move away from your horse, and squat with your feet tightly together, arms around your knees and your body curled down. This will keep you low, and minimize the ‘ground’ you could create for a lightning strike. Don’t lie on the ground. If you feel your skin tingle, your hair raise or hear a static like noise, go into the crouch position. Be sure that the storm is well passed before remounting. Winds can blow up quickly during a storm. In that case, dismount. High winds can make horses nervous. Stay out of heavily timbered areas. Take shelter in a sturdy building, or behind immovable landforms, like large rocks or boulders. Hail often accompanies storms. Your helmet will help protect your head, and your saddle will protect your horse’s back. Your horse will probably want to stand with its haunches towards the hail and wind. Dismount and pull your horse into a shelter, even if it’s just scrubby bushes that will break the fall of the hailstones. If it isn’t already doing so, encourage your horse to put its head down and do your best to protect it. Your horse may become very upset, so be careful that it doesn’t react in a way that hurts you. Remember that lightning often accompanies hail. Rain can change the footing on familiar trails. Heavy sudden rain can make pathways slick and expose roots or rocks that might not have been there before. Storms can down trees. A partially fallen tree might be a hazard to ride underneath. If you are at an event when a storm blows in, put your horse on the trailer, close the doors, especially if there is a ramp, and make sure all rump chains, towing safety chains and anything else that could conduct a circuit from the ground to the truck or trailer are clear of the ground. This includes lawn chairs leaning against the truck or trailer, sunshade poles or any other object that ‘connects’ your truck or trailer to the ground. Then, the safest place for you is in the truck. Without any pathways to the ground, your truck and trailer tires provide some insulation from a lightning strike. If hail or high winds blow in, at least you and your horse have some protection overhead. 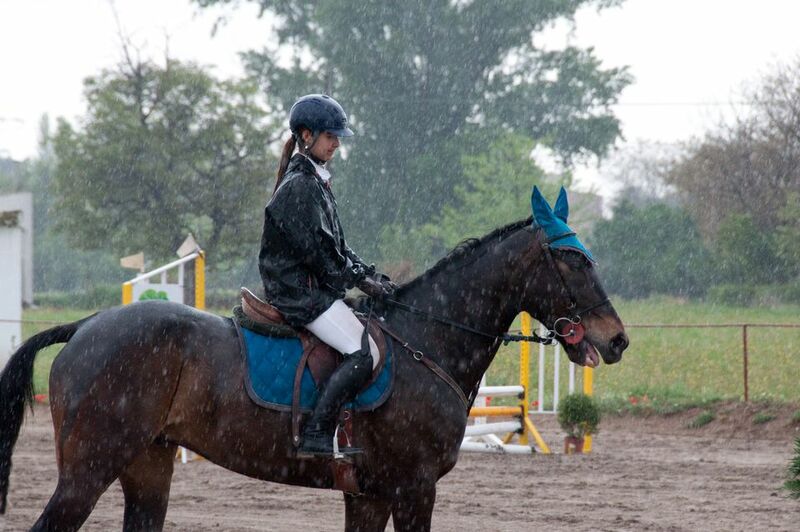 Even when riding in an indoor arena, a storm can spook your horse. The noise of heavy rain on a metal roof, and of course, thunder can make some horses come unglued. It also may not be completely safe to ride in a metal framed structure during a lightning storm. Lightning storms do kill horses in stables and shelters, and the best way to protect your horse, and your structure is with properly installed lightning rods.